CLICK HERE to view highlights from Spring Weekend! We hope you enjoyed the inaugural year as much as we did. EDUCATION: World Book Day 2019 - This year we were joined by Dermot O'Leary, Tom Fletcher and Frank Cottrell-Boyce. 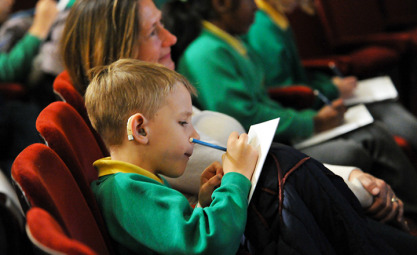 Young Writers' Competition - Find out how to enter this year's competition. CLICK HERE: to see highlights from Wimbledon BookFest 2018 including Shane Warne, Cathy Newman, Graham Norton, Sebastian Faulks and Nadiya Hussain. Tickets for our October festival will be available from July, to become a Friend and gain early access to tickets click here. Our Young Writers' Competition is now OPEN, to find out more click here. Wimbledon BookFest is a not for profit organisation promoting arts, culture and eduction, that aims to cover its costs. Every year the Festival enables almost 10,000 school children from more than 40 schools to take part in its education projects.